Formerly unexploited organic waste can be transformed into biofuel using the technology developed by the scientists from the EU BIOGO project. Over four billion tons of crude oil are produced annually. Electricity from solar, wind, and hydropower plants cannot totally supplant fossil sources of energy. At best, renewables could provide the energy required to run all the electric cars and to produce hydrogen for fuel cell vehicles. Still, gasoline would be necessary to power combustion engines, which will be operating for years to come. The only sustainable method to keep humans mobile is to substitute this gasoline with alternative fuels. Researchers at the Fraunhofer Institute for Microengineering and Microsystems IMM, working along with twelve research groups from seven countries in the EU project BIOGO, have formulated a method to create just such an eco-friendly biofuel. The innovative fuel’s ingredients originate from forests: “Wood waste and tree bark are available in great quantities throughout Europe but, up to now, have all been ignored as a resource. That makes them an ideal raw material, as they don’t need to be specially cultivated and thus won’t compete with food production,” explains Prof. Gunther Kolb from Fraunhofer IMM, who coordinated the EU project. Moreover, using wood waste is climate-neutral, since changing it into fuel for combustion only discharges carbon dioxide that the trees earlier extracted from the atmosphere as they grew. In other words, no extra greenhouse gases are emitted into the atmosphere. Additionally, the fuel can be made from wood waste anyplace trees grow. In contrast to petroleum, it does not have to be transported first from the source to refineries and then on to filling stations. An important component of the BIOGO concept is decentralized production. To achieve this, we have developed mobile production units that can be housed in containers and installed where they are needed. Gunther Kolb, Professor, Fraunhofer IMM. A prototype novel biofuel plant is located in the courtyard behind the Fraunhofer Institute. Waste products from the wood sector are converted in the white container into superior-quality gasoline. The Italian company Spike Renewables developed the primary process stage where the wood waste is heated to form a dark, viscous pyrolysis oil. This can be additionally processed in the mobile plant. The reaction chambers for this purpose, referred to as microreactors, have been created by scientists at the Fraunhofer Institute in Mainz. The first reactor changes the pyrolysis oil into synthesis gas by incorporating air, heat, and steam. This gas is used to generate methanol in the second stage. Extracting the oxygen from this, produced synthetic gasoline. The challenge was to optimize the process so we would end up with a fuel that is chemically indistinguishable from standard gasoline. Catalysts are required to quicken the chemical reactions. Thus far, large quantities of expensive metals and rare earth elements were needed to make such catalysts. In the BIOGO project, researchers at Teer Coatings developed a process to apply minute clusters of catalytically active substances to surfaces. This creates high-performance nanocatalysts that conserve resources. The final step required to put together the mobile production plant was to incorporate the entire technology into a container capable of matching all safety and fire protection necessities. Fraunhofer scientists together with Microinnova, an Austrian partner in the project, provided the engineering knowledge for the plants. The [email protected] container technology was created by the company Evonik. The prototype was built to house even larger reactors. In the not so distant future, the BIOGO teams will be involved in further developing the plant, with the goal of generating as much as 1000 liters of eco-fuel daily. Through BIOGO, the know-how to create sustainable fuel exists. Since the wood-based fuel has the same chemical properties as regular gasoline, the novel raw material can either be mixed into gasoline or slowly replace it totally. 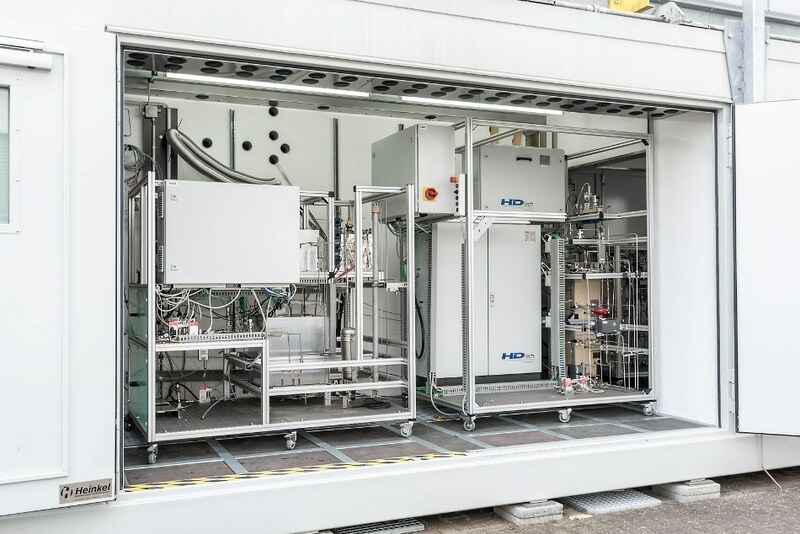 In the interim, the Mainz research team is also expecting to use the flexible and decentralized containers for other applications: The chemical and petrochemical sectors, for instance, have displayed considerable interest in the mini-factory concept. Chemical companies could utilize containers to make their procedures more flexible and to react more rapidly to their customers’ requirements.